During his lifetime, Henry G. Molaison (H.M.) was the best-known and possibly the most-studied patient of modern neuroscience. 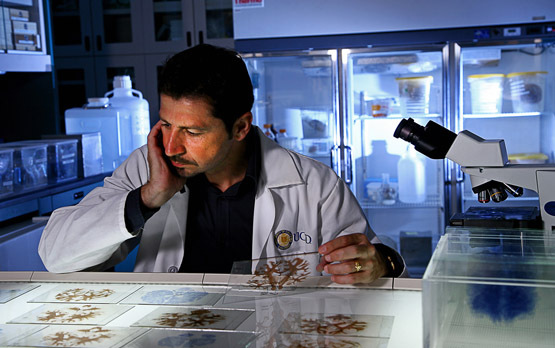 Now, thanks to the postmortem study of his brain, based on histological sectioning and digital three-dimensional construction led by Jacopo Annese, Ph.D., at the University of California, San Diego, scientists around the globe will finally have insight into the neurological basis of the case that defined modern studies of human memory. The microscopic anatomical model of the whole brain and detailed 3D measurements of the medial temporal lobe (MTL) region are described in a paper to be published online in Nature Communications on Jan. 28. "Our goal was to create this 3-D model so we could revisit, by virtual dissection, the original surgical procedure and support retrospective studies by providing clear anatomical verification of the original brain lesion and the pathological state of the surround areas of H.M.'s brain," Annese said. But the study reveals a small, circumscribed lesion in the left orbitofrontal cortex that had been previously undiscovered, showing the power of the technique. Based on the 3-D geometry of the lesion and the type of the lobectomy that was performed in 1953, Annese thinks this lesion was very likely created by Scoville during the surgery.